Celebrating the fearlessness of the cancer survivor and patients, Max Hospital Vaishali and Patparganj celebrated the Oncology carnival, today. Over 1500 members and cancer survivors took part in various fun activities. 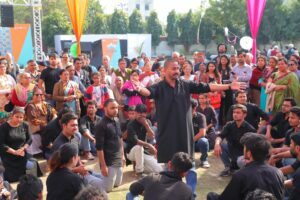 Nidarr Hanesha the oncology carnival, highlighted with varios events, programs and activities included gigs, Drums performance, stand up comedies, Nukkad Natak and several other carnival games. Cancer survivors and patients also took part in the ramp walk and kite flying sessions. 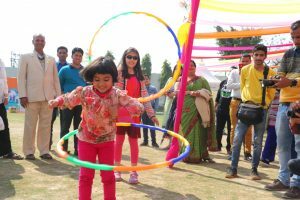 The grand carnival was organized at Sun Valley International School with more than 30 lip smacking food stalls. This is the first of its kind initiatives ever taken by Max hospital in order to boost the survivors and cancer patients with confidence that together it is possible to beat the deadly disease. “Though cancer is on the rise, with more and more awareness created among the masses, people are getting more sensitized about the ways to fight against it. To focus on providing complete and comprehensive cancer care, Max hospital Vaishali is all set to launch a dedicated cancer tower. While we focus on providing Quality Care & advanced treatment options; it’s equally important to spread the message of early detection as the symptoms get neglected & are diagnosed late. With latest & Advanced treatment options available backed by strong support, not only it is possible to survive, but the patient lead a better quality of life post cancer treatment” said Dr Gaurav Aggarwal,Max Hospital. Under the Initiative named with motivational slogan ‘Nidar Humesha’ which means stay courageous, Max Group of Hospitals celebrated the courage and victory of millions of cancer survivors who not only faced the Cancer with courage, but also their journeys offer hope, inspiration and courage. Nidarr Hamesha aims to celebrate the fearlessness of the cancer survivors and the patients fighting cancer by uniting together the doctors, management, nurses, NGO and RWA with the survivors and patients. Many cancer survivors shared their journey and better quality of life post treatment to motivate the patients fighting against it. “ Such events and many other initiatives taken by Max Hospital not only boosts any patients to fight against it, but also unites the family members and near ones to support the patient. While I was diagnosed with stage 3 cancer, the counseling and support provided by the doctors and the Hospital plays a major role in the psychology of the patients to stand tall against the so called deadly disease. After my treatment I fell better and have a good quality of life, and my aim is now to support such events and initiatives and try to spread joy and happiness among the patients to provide them with strength to fight.” Said one of the cancer survivors.